The best critique I read of Michael Moore’s Fahrenheit 9/11 took him to task for not doing more with his historic opportunity to present a damning case against the Bush administration’s many abuses leading to the current war in Iraq. Sure, Fahrenheit 9/11 made an emotional case, but it wasn’t substantive enough to make the Fox News crowd or their supporters ashamed. He was preaching to the choir. Moore learned at least one lesson. In his newest film SiCKO. He is preaching to a bigger choir. Moore takes on the private healthcare bureaucracy in the United States. 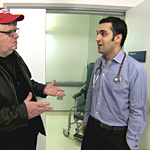 He introduces us to a half-dozen Americans whose lives are made worse by an uncaring and expensive health care system. A 79-year-old man spends his “retirement” working as a janitor at a grocery store because he can get an employee discount on prescriptions. A carpenter cut off two fingertips and could only afford to reattach one of them. Moore shows us many of the dirty secrets of the health care industry. One insurance-company doctor allows his signature to be rubber-stamped onto denial letters that he has never read. In one case, insurance-company doctors are awarded bonuses for denying more claims than their peers. Blue Cross employs people whose job is to look for minor technicalities on patients’ paperwork so that they can be denied coverage. One woman was kicked out of her plan after one of these goons found she failed to disclose a yeast infection — Blue Cross said she should have mentioned it under the section asking for previous “major” medical problems, and then they refused to pay for a surgery that they had already approved. Later, Moore shows security camera footage of the incoherent woman in Los Angeles who was taken by cab from a hospital and dumped unceremoniously on skid row, still wearing her hospital gown, and unaware of where she was or what was happening to her. Moore then takes us to Canada, Great Britain, France, and Cuba, where he finds patients, doctors, and medical workers who tell him over and over that medical care is free in these countries. He finds a man who had cut off two fingers and had them reattached, free of charge. He finds a doctor in London who is rewarded, not for denying the most coverage, but for having the most patients with low blood pressure or the most who quit smoking. Finally, he shows patients leaving a British hospital where the poor are given cab fare to get home if they can’t afford it — and only if the are fit to leave. SiCKO is extremely effective. Those with weak hearts and excitable temperaments should probably not be allowed to see the film. If you’re not outraged by the anecdotes from the American insurance companies, you aren’t human. I hope that public reaction to the film is strong enough to effect real change. If “effective” were the only measure of a documentary, I’d probably have to give SiCKO our highest rating. But there are other criteria that are also important, and Moore fails on some of them, including completeness and respect for opposing points of view. His movie would have been even stronger had he done more to rebut genuine arguments from the other side. For example, many people in the film talk of “free” healthcare. But it isn’t free. It’s paid for by taxes. I was recently in England and I felt stifled by the high cost of just about everything. Rather than telling us what it costs to run a national healthcare system, Moore picks a single wealthy French couple and asks them where they spend their money. They don’t mention taxes, so apparently that’s supposed to prove that taxes aren’t too high. I wondered if the youths rioting over double-digit unemployment would have given him the same answer. We recently saw how the government handled Katrina. Is that how we want our healthcare to look? The Bush administration has notoriously appointed political hacks to jobs they are not qualified for, based on their loyalty to the party. What if your health care system were run by people doing a “heckuva job?” Moore doesn’t address this concern. Moore shows us a prescription inhaler that costs $120 in the United States being sold at a Cuban pharmacy for the equivalent of 5 cents. But where did the inhaler come from? Where was the drug developed? Moore doesn’t say, but it was probably developed in the United States and not in Cuba. Pharmaceutical companies say that a not-for-profit system could be a disincentive for spending money on R&D. I don’t believe much of what big-pharma mouthpieces say, but Moore doesn’t even ask. One of the genuine complaints that Moore does (sort of) address is why I should pay for a smoker’s cancer treatment, or why the smoker should pay for my obesity, or why the evangelical should pay for someone’s abortion, or why the lesbian should pay for someone’s Viagra. He puts the question to a Canadian conservative who says that it’s just a matter of culture. He doesn’t say it in so many words, but I think his point is that no system is going to be completely perfect, but for the greater good of all citizens, it’s fair to demand a little compromise on our own personal reservations. Another shortcoming of SiCKO it that it lacks facts. There are some worked into Moore’s narration: Canadians, Brits, and French live 3 years longer. All four countries have lower infant mortality rates (the U.S. is ranked 37th). We’re the only Western nation not to have a national health care system for all citizens. But in a movie of this scope and length, there is a surprising dearth of numbers, facts, figures, and other objective measures. The movie conveys what it feels like to need health care in different countries, but there’s not much in the way of admissible evidence. The filmmaking is very good. SiCKO is a long movie that flies by. The editing by Geoffrey Richman, Christopher Seward, and Dan Swietlik is very good, helped by Moore’s narration. He takes us from one segment to the next with a seamless segue, then stands back and lets a strong scene play out. There is only one “ambush” scene, and it’s played for laughs and not winces. SiCKO is a very positive movie; it’s not angry or sarcastic. It is meant to entice Americans to dream of a better day. That’s a noble goal, and the film is emotionally convincing. The only problem, as with Fahrenheit 9/11, is that Moore doesn’t do more to make his issue movie watertight. Here’s hoping all the conversations spawned by this movie will fill in the gaps.